the year my dog died is an exhibition of sculptures. 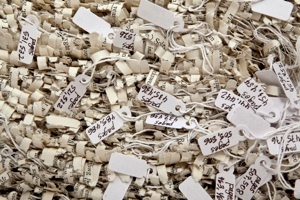 Overwhelmed by the never ending accumulation of pay statements, house bills, photographs, credit card and ATM receipts, Sandra, after shredding documents to eliminate personal data, began sewing them into sculptural forms. These works consider how accumulation defines us. 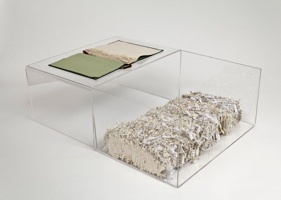 Other works, one made from a shredded novel, another from a shredded dictionary, refer to the accumulative nature of language and culture. Impermanence is deliberated in the process of shredding and making: undoing and redoing. shredded paper, thread46 x 46 cm. 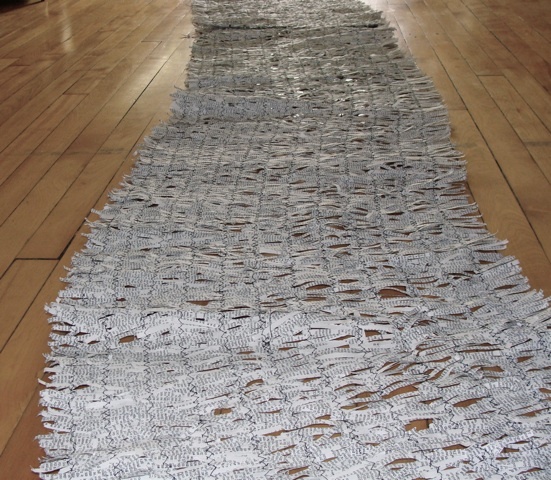 shredded paper, thread 46 x 46 cm.